For cases you want to disable the Forum icon in the main LMS header for whatever reason, it is possible. 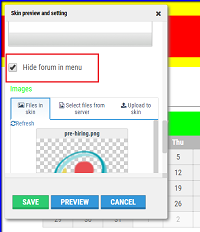 Forum disable is possible to be done in the SKINS where Logo & Color adaptation is allowed. Just go to the skins module, select the skin and open for editing. Scroll down and find the Forum disable checkbox, mark it and save. To apply the changes you may use the PREVIEW in the editing mode where you directly see the skin appearance. To apply the SKIN to the real use, you need to activate it.